Ergonomically designed cutlery that supports school aged children in learning to hold and use a knife and fork confidently and independently. 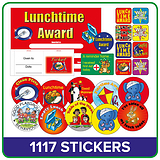 The colourful stickers provided can be used to independently guide little fingers to hold the knife and fork correctly. Quality stainless steel with soft touch green BPA free handles. Suitable from 3 years upwards. Dimensions: Boxed - 20.5 x 10.5 x 4cm. 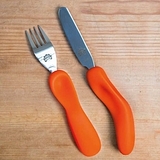 This knife and fork set is perfect for little hands. 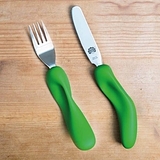 Their easy grip and colourful handles make these the ideal first cutlery set.